I am continually amazed by the arrogance of liberals and how "little" they think of us. Fifteen years working at a TV station, a liberal propaganda factory, I am familiar with their snooty mindset. "The general public are unsophisticated yahoos." Interviewed on the O'Reilly Factor, ABC News' chief political correspondent George Stephanopoulos was asked why Obama's approval rating was plummeting. Incredibly, Stephanopoulos gave every excuse under the sun for Obama's decline, completely ignoring the elephant in the living room which is Obama has governed totally against the will of the people. Apparently, to Stephanopoulos, the opinions and feelings of everyday Americans are irrelevant. After all, what the heck does mainstream America know? As I said, I've worked in Stephanopolus' media world and know the mindset. A little interesting side bar to prove my point that liberal media holds the general public in contempt. My career in television ended in 1993. The big "inside" joke of the liberal dominated broadcasting industry was the "Regis and Kathie Lee Show." Libs thought their show was too wholesome and all American. Kathie Lee was particularly despised by them for being a Christian and too Miss Goody Two Shoes. And yet, Regis and Kathie Lee were king and queen of morning programming; loved by the masses and hated by the liberal industry elites. Many producers attempted to dethrone Regis and Kathie Lee with so-called, "hipper" shows, only to have their "we think the general public are unsophisticated yahoos" butts kicked, big time, in the ratings. Liberals in government treat us like idiots as well. In panic mode sensing their devastating defeat in November, the Obama administration, without evidence, accused republicans of accepting illegal foreign campaign funds. When asked to prove their serious accusation, the official Obama administration response was that the burden was on the republicans to prove they are not guilty. Folks, what kind of absurd nonsensical reasoning is that? Obama and company think we are idiots. Liberals have a history of assuming the general public is gullible inferior idiots. Liberals run political ads filled with lies and throw false outrageous accusations expecting their stupid base to fall for it. In the battle to pass Obamacare, liberal democrat Alan Grayson actually said, "Republicans want you to die." I still remember the incident of a little black girl crying her eyes out in fear during the Bush presidential campaign. The self proclaimed paragons of truth and compassion, liberal democrats, told her if Bush won the election, she would be put back into slavery. Hidden in Obamacare is a plethora of government controls epitomizing liberal's superior knowledge on how we should be forced to live our lives. Liberal actress Jeannine Garofalo said black RNC Chairman Michael Steele "suffers with Stockholm Syndrome." So, according to Ms Garofalo, blacks who do not hate or resent their country are ill. How unbelievably arrogant, racist and superior minded. Speaking of Michael Steele, liberals are quick to call people racist. But, for some reason, they feel free to use racial epithets, racist cartoons and racist doctored photos to punish conservative blacks. 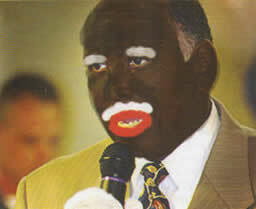 Here is a photo of Michael Steele doctored by a liberal blogger when Steele ran for Lt Governor of Maryland. The caption under the photo read, "Simple Sambo wants to move to the big house." Libs particularly "dis" minorities by always suggesting standards be lowered to "let us po inferior people of color" in. It would be absurd to think minorities could succeed based on merit; like white folks. Bottom line, liberal attitudes are insulting, racist, arrogant and superior. I can not comprehend how any thinking person, especially a minority, could embrace the liberal's agenda as beneficial. Liberals in government treat us like idiots as well. In panic mode sensing their devastating defeat in November, the Obama administration, without evidence, accused republicans of accepting illegal foreign campaign funds.